SARASOTA COUNTY – Sarasota County commissioners today honored 13 elementary school artists whose illustrations appear in the 2015 "Catch the Rain" calendar. More than 1,500 students entered this year's competition to illustrate ways to use landscaping methods that mimic Mother Nature in catching and keeping more of our rainfall to water plants and reduce stormwater runoff. "The goal of the 'Catch the Rain' calendar is to show the community's youth and their parents how easy it is to capture this vital natural resource, and how this helps keep our bays healthy," said Rob Wright, who coordinates the calendar contest for Sarasota County through its Neighborhood Environmental Stewardship Team (NEST) program. 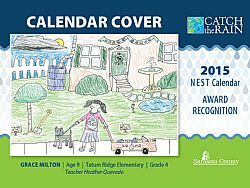 The popular annual calendar contest is open to any elementary student in any public or private Sarasota County school, including charter and elementary-age home-schooled students. Each winner's school will receive a supply of calendars, and copies of their winning artwork will be displayed throughout January 2015 in the Sarasota County School Board Administration offices. Copies of the calendar will be available at all county public libraries and administration facilities after Jan. 1. To get a free copy of the 2015 "Catch the Rain" calendar, or to learn more about the NEST program, call the Sarasota County Contact Center at 941-861-5000 and ask for Rob Wright.